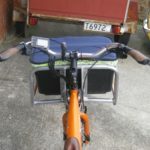 Home › Electric Bikes › Electric Yuba – well it is a cargo bike! 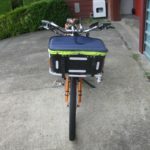 Electric Yuba – well it is a cargo bike! The build of the Yuba is nearing completion, only one project to complete after the fitting of these bits and pieces. 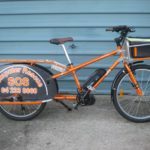 So the Yuba is a cargo bike, and I bought it to serve as a business vehicle so that I can visit customers within a 10-15km range of the workshop, without spending $6-10 dollars on petrol. It is also a point of difference for the business which I will make more of in the future. 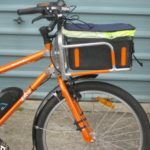 You can buy a whole bunch of cargo carrying bits and pieces to fit a Yuba, which are all beautiful bits of kit, but with the prices to match. This was always going to be a budget build, I saved about $2500 to $3000 building it myself, so I am not going to spend another thousand bucks on flash Yuba branded gear that doesn’t quite do what I want. 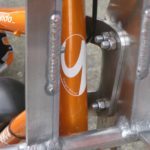 Luckily, the Yuba comes with lugs, many many lugs, threaded in various sizes, and usually with the correct setscrews already fitted into them. This means that designing and making your own parts is relatively easy. So phase one was the rear of the bike. 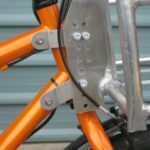 The rear rack which is a substantial part of the bike comes without a deck, but has 8 lugs with bolts ready to attach one. I looked at what was available, and decided it was a relatively simple design job. So I measured carefully the position of all the lugs, the diameter of tubes etc, and designed a deck, which I cut out of some building ply I had lying around. As a bit of customization, I cut two cup holders into the deck, so that I can carry a long black (for me) and a large cappuccino for Lynn from our favourite coffee carts to Lynn’s work or to nice parks to drink them. Phase 1a was the “footboards”. The frame for these is removable, and also comes with lugs. I was in two minds whether to put these on, and still am unsure about whether to continue using them. I am getting my foot caught under them when I set off using the throttle, and my feet trail behind the pedals. However, if they are on they need something to fill in the gaps. 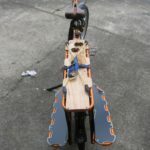 Again, fitting lugs were provided, however measuring their positions accurately was much harder, lots of trial and error making paper versions, foamboard versions, and finally ACM (aluminium composite material) versions. Even in the final versions I had to modify the hole positions as I fitted them to the frames! The ACM is white, so I made some black vinyl graphics to fit. Luckily for me, 20,000km away, I have a son who is a qualified general technician, who has access to some sophisticated CAD/CAM equipment for cutting and bending some rather nice materials. So I again did some very careful measuring, and did a reasonably accurate rough design, which Richard interpreted into two absolutely superb brackets. 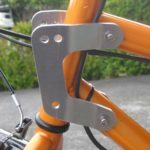 The bike is not as accurate as the brackets, so I needed to relieve the bike attachment holes in the brackets by a total of 0.5mm to fit the slightly mismatched lugs, but the bolts between the rack and the brackets just slipped through all 6 holes – magic! When all was tightened up, the rack was as firm as could be, really rigidly fixed to the bike. 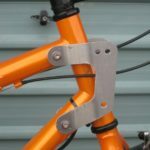 Pictures of the rack fitted to the brackets. 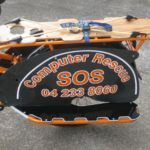 The orange sections of tubing are covered in a 3M reflective vinyl, the same vinyl which is used for the sign writing at the rear, and around the edge of the footboard frame (covering the scrapes and damage that a shop soiled bike will have). 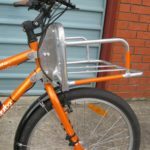 Its a pretty good match for the metallic orange Yuba paint, until you shine headlights on it at night, then its like a big Christmas Yuba! The front brake cable was a little short to go either way, around the outside (as in the pictures above) or down the middle like the rest of the cables, and was getting stressed when maneuvering the bike in and out of the garage and parking places. I bought an outer cable about 300mm longer, and a replacement inner cable, and routed the cable down between the rack mounting plates, and looping out to provide as gentle a path as is possible to the V-Brakes. The rear brake and gearchange cables go down the middle and back to the boom and downtubes with little extra stress. The smooth top tube of the rack provides a nice track for the cables to slide along when the wheel is turned. 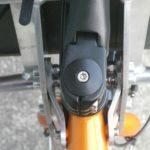 The electric system loom also goes along the handlebars and down the stem and around the head tube quite nicely. 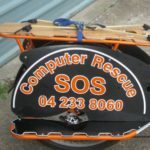 The final project is a pannier, or set of panniers, tailored to fit the rear of the bike, at least one of which will be padded and of a size to carry a desktop computer without it getting damaged or wet. A tall order, but I am part way through the design now, and have all materials ready to go.